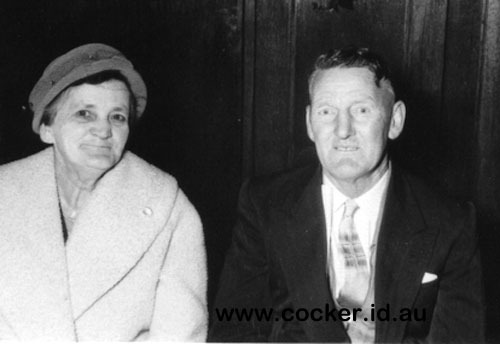 3-Ella Beatrice (Danny) Crothers was born on 19 Sep 1898 in Ringarooma and died on 9 Aug 1973 in Launceston at age 74. Ella married Claude James (Jenna) Wilson on 27 Oct 1926 in the Church of The Ascension, Winnaleah. Claude was born on 23 Jan 1902 in Ringarooma. They had two children: Desmond James and Rhonda Ella. 4-Desmond James Wilson was born on 1 Jan 1931 and died on 18 Mar 1989 in Launceston at age 58. He was cremated on 22 Mar 1989 in Carr Villa Cemetery, Launceston, Tasmania. 4-Rhonda Ella Wilson was born on 24 Jun 1937. Rhonda married Athol Robert Percy Murray on 18 May 1957. Athol was born on 12 May 1935. They had five children: Lynnette Gaye, Christine Joy, Michael Leslie, Robert James and Sharyn Louise. 5-Lynnette Gaye Murray was born on 23 Feb 1958. 5-Christine Joy Murray was born on 3 Jul 1959. 5-Michael Leslie Murray was born on 18 May 1962. 5-Robert James Murray was born on 22 Oct 1964. 5-Sharyn Louise Murray was born on 1 Jul 1971 in Launceston.